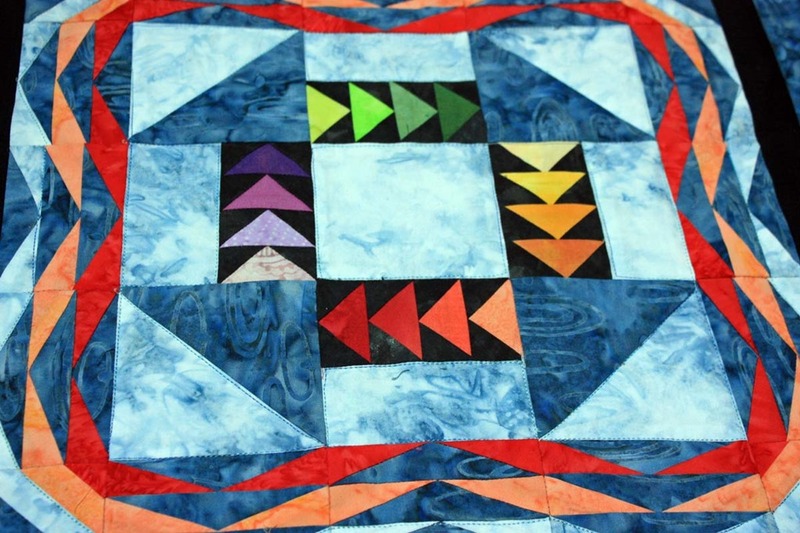 #PQ7 There’s one last challenge this year for Kim Lapacek’s PROJECT QUILTING (2016). My goal this winter was to make a quilt or quilted item for each challenge. And I’ve just made it! When I heard the challenge was “A Goose in the Monkey Wrench”, I immediately thought about creating my own version of a large “Monkey Wrench” block by inserting “Flying Geese” into and maybe around it. 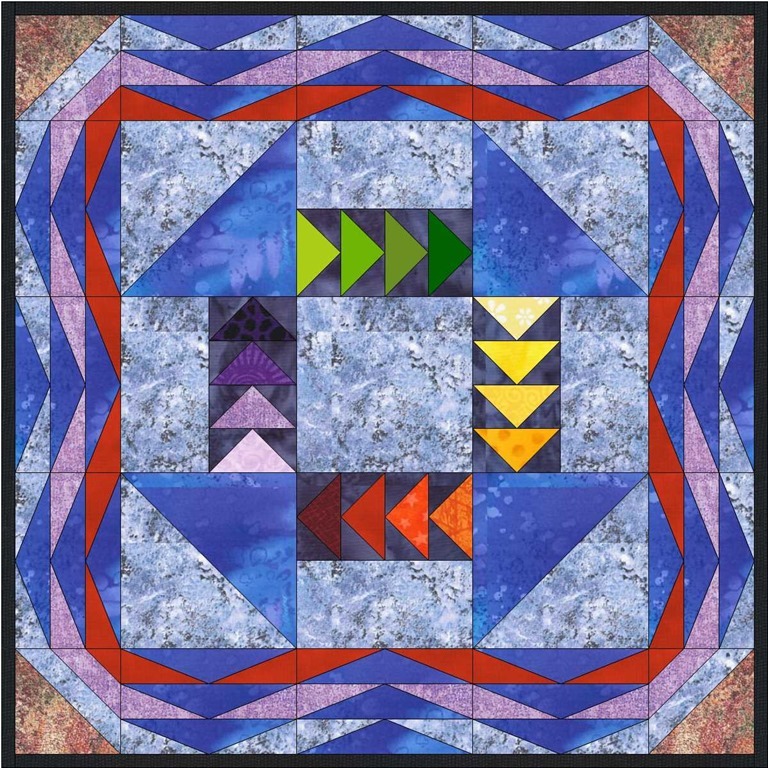 I opened up my Electric Quilt (EQ7) and found the “Monkey Wrench” block, then inserted Flying Geese around the structure of the block. It needed more, so I played around with adding flying geese in the border, turning and twisting them until I found an interesting pattern. This is what I came up with (above) after several trials and quite few different colorings. I’ve always wanted to do flying geese in gradated colors….now’s my chance. 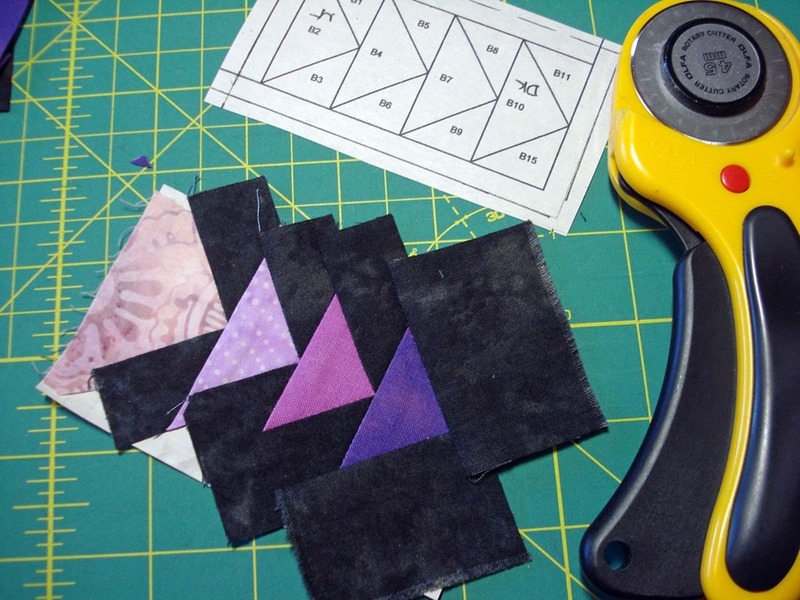 What I love about paper piecing is the precise points. I could never do that with regular cutting and piecing. Some people can…but not me. Here’s what it looked like after the center was finished and I started on the “flying geese” border—yikes, there’s a lot of little pieces! Looks overwhelming. 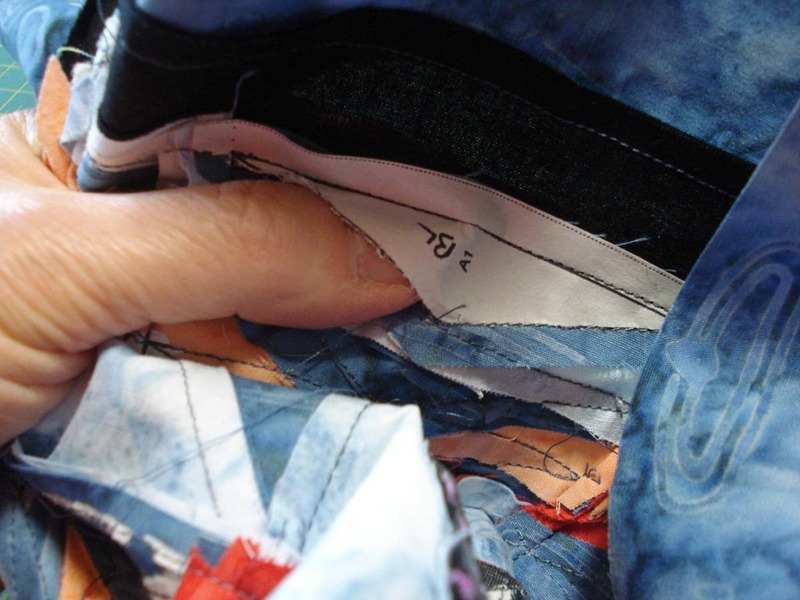 The only thing I don’t like about paper piecing is peeling all the little bits of paper off the back of the quilt top after it’s sewn together…but a good movie, and it goes quickly. 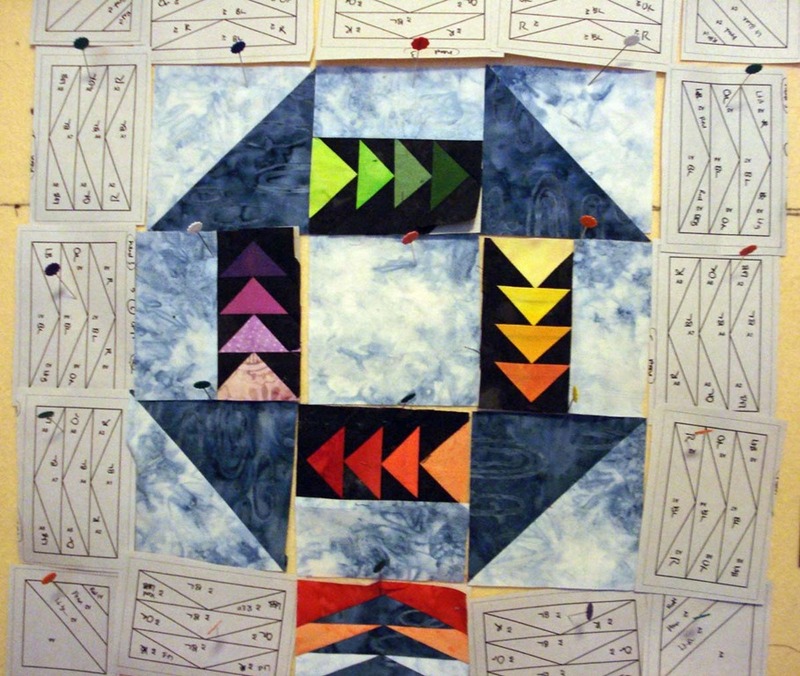 Here (above) is the mini art quilt–quilted, bound, and finished. 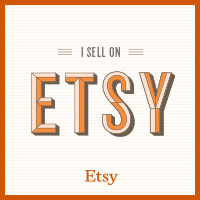 It’s now for sale in my Etsy Shop here. 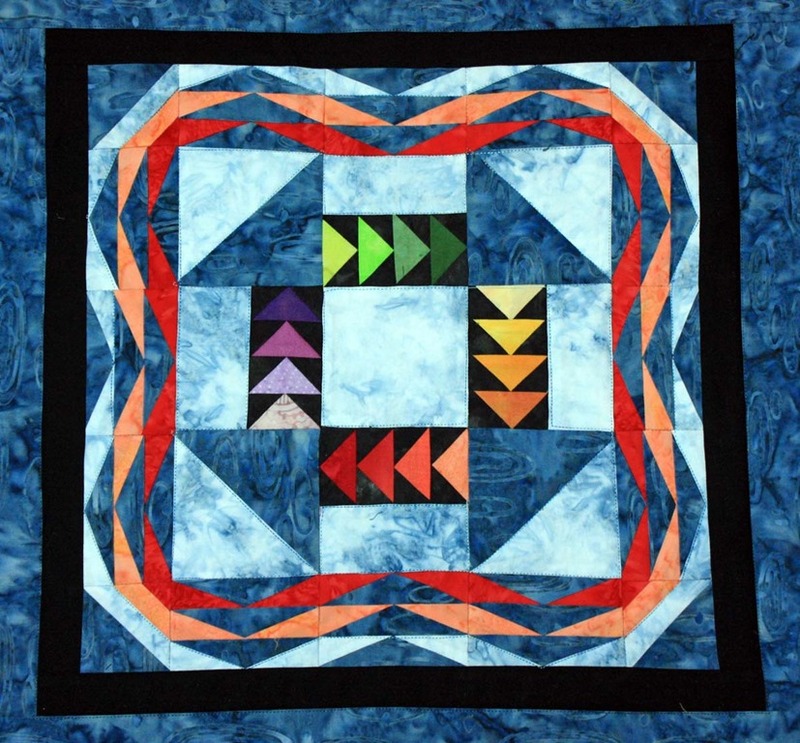 I like the curves that were created by the flying geese around the border—reminds me of ribbons. 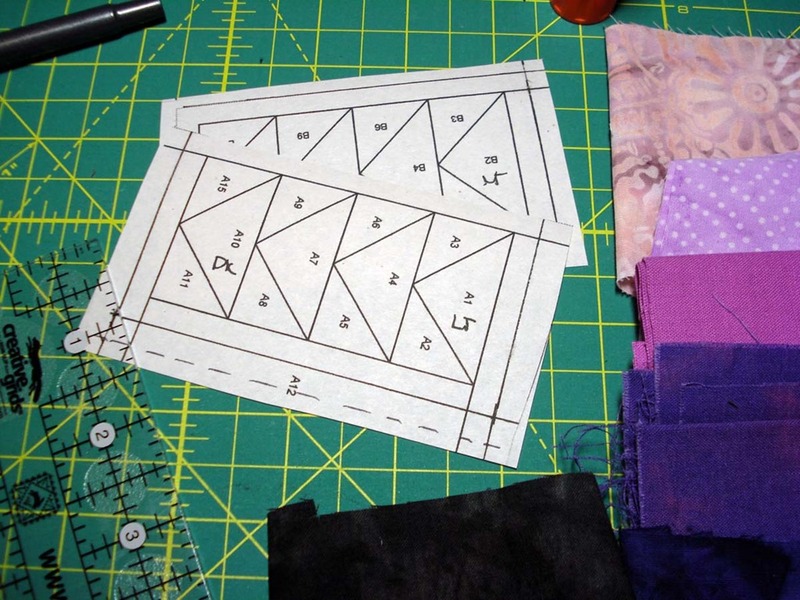 I chose to do a simple stitch by the ditch (not “in the ditch”) quilting. 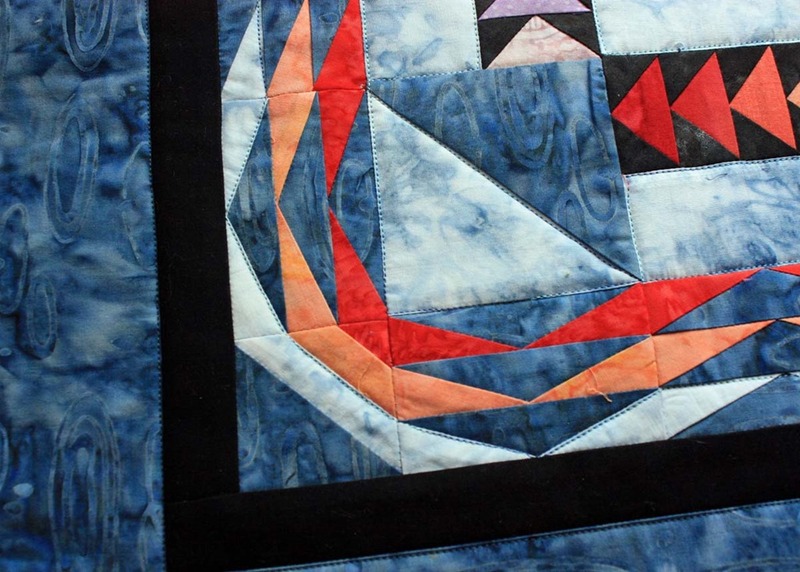 Here’s the finished quilt (above), and the EQ7 rendition (below). The colors are different, but it did turn out very much like my EQ7 rendition. So the Challenge is finished for this year. 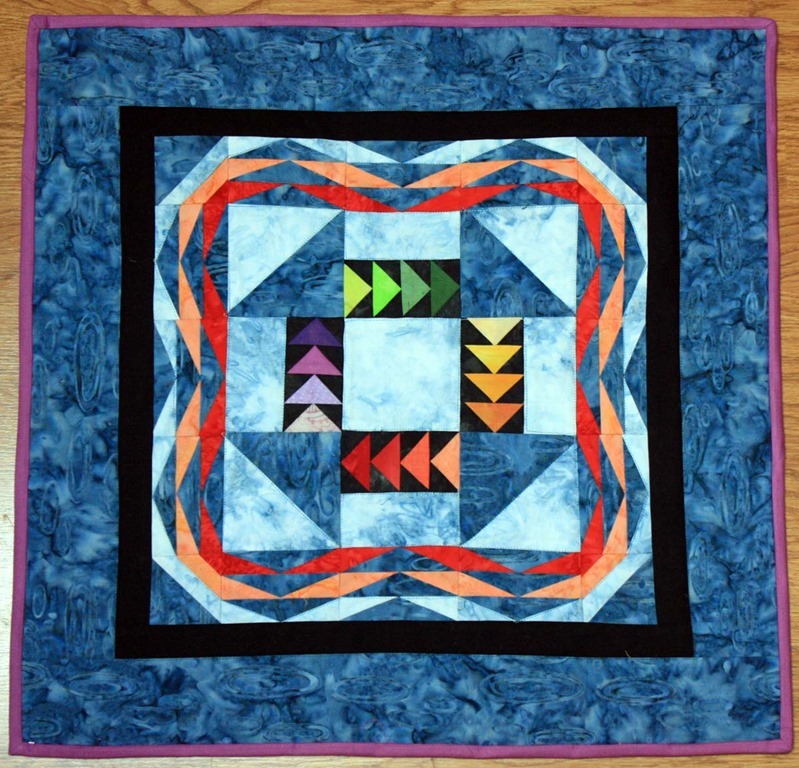 I want to send a special “thank you” to Kim Lapacek (and her mother) for all the hard work to make PROJECT QUILTING a reality. I hope you’ll stop by Kim’s “Persimons Dream” website to vote for your favorite entries. The voting begins at noon Sunday, March 20 and ends March 25. I got the chance to talk with Kim at the Sun Prairie Quilt Show just a few weeks ago–she’s so much fun (that’s her on the right). Catch her website to find out more about the quilts shown in the background. UPDATE: The voting has ended and mine came in at second place (out of 32 entries). Thanks so much for your votes! It was a lot of fun. Looking forward to next year!